RDA Central Coast has coordinated unprecedented regional collaboration in the development of the Regional Infrastructure Priorities List. The population of the Central Coast is expected to grow by 70,000 to around 409,000 over the next 20 years. This substantial growth will require over 30,000 new jobs to be created over the next 16 years. 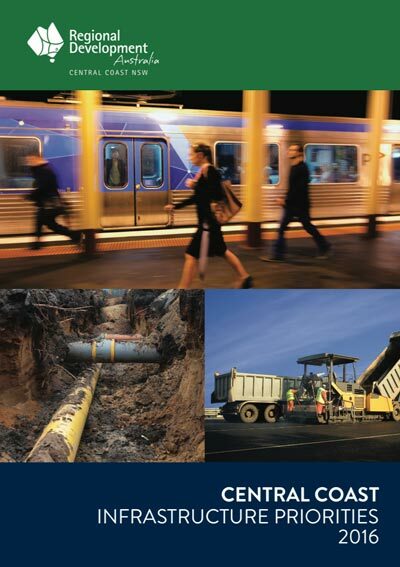 To respond to this demand, RDA Central Coast has coordinated the development of the 2016 Central Coast Infrastructure Priorities List, which provides an agreed list of the key-enabling infrastructure needed on the Central Coast to create local jobs, drive further investment and to assist in unlocking the full economic potential of the region. The following criteria was utilised by members of the group to form the 2015/16 infrastructure priority list. The project can be delivered within 4 years (of funding approval). The project is achievable, ie. scope defined, cost established, planning approval in place or process. Project funding has not already been committed. Timing of infrastructure aligns with funding opportunities. The infrastructure must enable the delivery of additional and new regional benefit, i.e one investment delivers multiple outcomes. The request for funding must be at a realistic and achievable level. The projects contained in the Infrastructure Priority List will lay a strong foundation for further growth and investment and will directly assist in generating required jobs within our region over the next decade. Please note that the following infrastructure project list is a dynamic document that will be reviewed regularly to ensure that projects reflect the changing priorities and opportunities within the region. Please Email for additional information.